Showing results for tags 'dryer'. 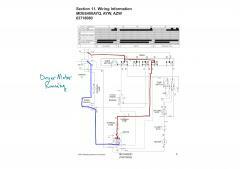 Schematic markup to help troubleshoot a low heat complaint in a GE electric dryer. 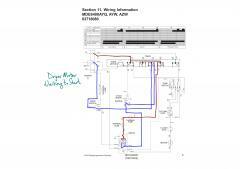 Requesting service manual/Tech Sheet please. Trying to help my ex save some $ and figure out why their dryer won't start up. Worked yesterday. Doesn't today. It was moved into new house on Saturday and worked after setting it up fine. Gets power, drum lights up. Drum turns freely. But won't start. I suspect thermal fuse as I've had one go out on a previous dryer but know little about this model so far. I know there can be other causes. Lint duct is clear. Was getting ready to go start testing things with my meter but thought I'd reach out here first. Thanks in advance! I had two service calls recently on two different dryers with the same problem: the motor wouldn't run. These are two different dryers: one an old skool Whirlpool-built unit with the lint filter on the top panel and the other a Maytag Neptune-style dryer. Different disassembly, wiring, and schematics, and completely different timers. But in both cases, the problem was the same--a burnt contact in the timer (failed open so would not close). 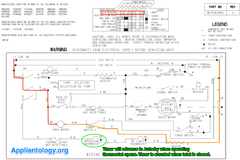 In the two videos below, I show you how to use the schematic not only to precisely identify the specific failed contact in the timer, but also how to do a field repair to bypass that failed contact and get the dryer safely running again without replacing the timer--all in the first trip. Being able to do these repairs was only possible by understanding how basic electricity and circuits work and by reading the schematics. There is no other way. Well, I guess you could just memorize a bunch of monkey tricks like, "If motor no run on a Maytag Neptune dryer, jumper the yellow and gray wires together." Yeah... good luck with that. What's interesting about these two videos is that the repairs done on each are electrically identical but the physical repair looked entirely different between the two. And that's exactly what you should notice in these two videos. Would you like to be able to troubleshoot like this? You can! These are the kind of skills we teach at the Master Samurai Tech Academy. We're not teaching anything new or pointy-headed, or academic-- these are the skills that most appliance techs used to have 20 years ago but have been largely lost to the trade. That's why you see so many techs out there who don't know how to even begin to troubleshoot an electrical problem and, as a result, the trade is ate up with parts changing monkeys. 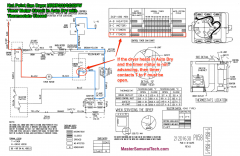 There is a better way: the Master Samurai Tech way. Start with our Fundamentals course. Don't let the name fool you-- many techs, including those with 20+ years experience do not know what we teach in the Fundamentals course. We know because we've had many students in exactly this situation-- over 20 or even 30 years experience-- take our Fundamentals course and then tell us it was a game changer for them. It can be for you, too. The first video shows the field jumper repair on a Maytag Neptune dryer and the next one is an old skool Whirlpool dryer. Watch and learn. Replaced the front support bearing and bearing slides a month ago and now I'm getting a rhythmic rattling when the dryer has a wet/heavy load. When the clothes begin to dry out or the load is very light there is no rattling. I've taken everything apart again and put it back together but the problem persists. It seems like it may be coming from the bottom left, where the idler pulley is located. The pulley seems to have quite a bit of play on the idler arm. I don't know if it will work, but I've uploaded audio of the rattling here . Thank you in advance!